Spreadsheet templates are widely used by investors and companies to build sophisticated financial models with the aim to accurately forecast the financial performance of a company. Finance spreadsheets are used to answer specific financial questions such as how does the finance structure look like, what is the internal rate of return of an investment proposition or how much will be the equity stakes after several rounds of financing. Company valuation Excel spreadsheet focus on the value of a company, mostly via the Discounted Free Cash Flow (DCF) analysis. True finance Excel templates are prepared for financial modeling purposes and are a bit more complicated to build than spreadsheets for personal or accounting use. The expected financial performance heavily depends on its assumptions and the development of important key value drivers – specific to the business or its industry – which need to be carefully analyzed. Also for professional use, the calculations need to be a bit more sophisticated and allow for scenario and sensitivity analysis to better understand the associated risks. Thus financial model spreadsheets can be quite time-consuming to build. That’s why we have developed eFinancialModels. Below we shortly review the free spreadsheet templates available on eFinancialModels. If you know of any other good financial spreadsheet, which should be reviewed and made available to eFinancialModels community, please drop us a note. A mobile app business normally derives revenues from paid downloads, in App advertising and subscriptions. The app developers then have to think about their marketing budget to figure out how much they can pay to acquire one customer so that they can scale their business in a profitable way. These calculations require a sophisticated spreadsheet. eFinancialModels provides such a spreadsheet template to make it easy for app developers to forecast the cash flows of their app and show a convincing business case to their investors and partners. Below screenshots provides a cockpit view on the assumptions and outputs of the financial model, which the spreadsheet contains. Software as a Service (SaaS) has become an important concept to consider for any IT company due to new cloud deployment technologies and faster internet connections. The specialty of SaaS companies is to charge a subscription fee for the use of its service. Forecasting the cash flows for a SaaS company requires quite a bit of financial modeling but must be done as for many SaaS companies proper cash management is key to survive. The spreadsheet template for SaaS companies thus makes the financial modeling exercise easier and allows to calculate all the company and investor relevant metrics such as Average Revenue per User (ARPU) for SaaS companies. Find below the screenshots of the cockpit view with several more detailed financial spreadsheets included in the model. 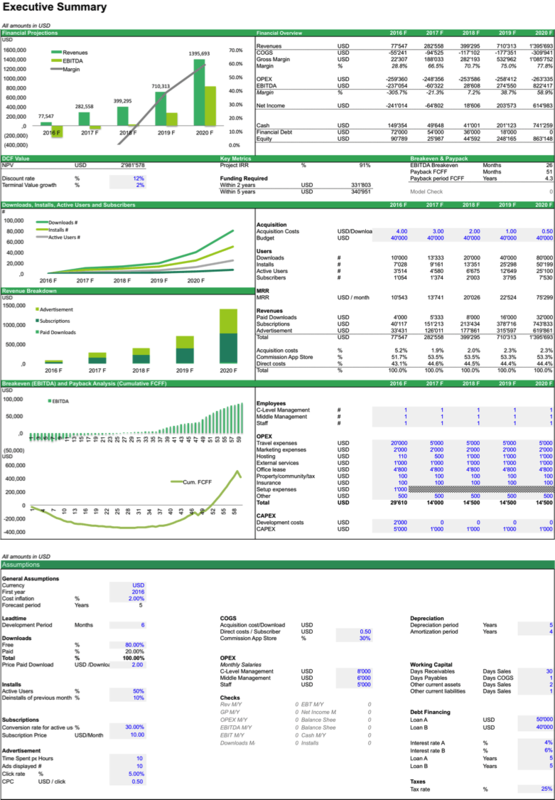 Download our SaaS spreadsheet templates for different financial purposes at efinancialmodels.com. It’s a perfect way to analyze your business for budget planning, project management and invoicing. Starting an eCommerce business has become a great way to start a company. An eCommerce business relies on the Internet to find its customers and thus needs to find cost-effective ways to drive traffic to its website. Thus one of the key metrics to consider for an eCommerce business, are its Customer Acquisition Costs (CAC). These costs need to be lower than the Customer Lifetime Value (CLV) and pay for all costs during the customer lifetime. Only then, the entrepreneur has a viable business model. A spreadsheet template specific to ecommerce companies is needed to understand the business’ cash flows and build the appropriate financial model. See below the screenshot of the cockpit of the spreadsheet provided by eFinancialModels while the model also includes several more detailed spreadsheets to forecast the cash flows for the eCommerce business. The Internal Rate of Return (IRR) provides a framework to understand the financial attractiveness of an investment. As the IRR should be higher than its opportunity costs – measured by the WACC – IRR also provides an answer whether to undertake a project or not. In case of investment projects, such as building a new Greenfield plant, the IRR is calculated based on the free cash flows the project will generate over its lifetime. This spreadsheet provides a comprehensive forecast for cash flows and the balance sheet for a project finance project. Below screenshot includes the IRR calculation while the financial model contains a comprehensive forecast about the project’s financials (income statement, balance sheet and cash flow statement) for a period of 10 years. The IRR Project Finance Analysis forecasts the expected financials for a greenfield project and calculates the levered and unlevered Internal Rate of Return (IRR). The capitalization table (cap table) spreadsheet provides an overview of the capitalization and ownership stakes during a series of financing rounds. In this finance excel template, the funding series normally start with seed financing followed by Series A, B, C, etc. By raising more equity financing, existing investors get diluted each time new financing is raised, meaning their equity stakes get smaller. The cap table spreadsheet template provides entrepreneurs with a quick overview to understand the impact of equity financing scenarios on their share ownership stakes. Below screenshots provide the important calculation of the cap table spreadsheet. Apart from the investor’s stakes in the company, also their IRR is calculated based on entry and exit valuation. Private Equity firms normally have a different way of looking at a company up for an acquisition than a family or corporate buyer. First, as a financial investor who focuses primarily on the strategy rather than execution, they will require a management team to actually run the company on a daily basis. Thus its called Buyout when the acquisition is done with the existing management team, Buy-In when a new management team is being brought in. Second, Private Equity firms prefer stable cash flows and have a preference to use financial leverage to increase their returns through financial engineering (leverage). Third a Private Equity investor normally is structured as a fund, thus has an investment horizon of ca. 5 years as investors will want to exit. Thus a spreadsheet used for Leveraged Buyout (LBO) analysis needs to include a debt schedule and an entry / exit calculation to come up with the expected IRR for this investment. This finance excel template or LBO spreadsheet provides the required framework to run the respective analysis. A business with tax loss carryforwards, which can deduct past losses from current profits, is more valuable than a business without tax loss carryforwards. Ergo you will end up paying higher taxes in the future. CFOs and Financial analysts, therefore, use a spreadsheet template to analyze and calculate how much value those tax loss carryforwards have. eFinancialModels provides such finance Excel template to calculate the future tax savings and the Net Present Value of such tax loss carryforwards. Below screenshots show the deductions of tax loss carryforwards and tax carrybacks from the taxable income. Ever wanted to know how long it takes till the financial debt has been repaid? This is the financial spreadsheet to use. Simply enter the relevant figures and the model outputs the number of years required until the debt has been fully amortized. The screenshot below provides an excerpt of the spreadsheet and summary sheet contained in the model. This simple amortization table calculates how long it takes for a monthly installment to repay debt via monthly installments. This spreadsheet template provides real estate investors with the framework to forecast the cash flows from a renovation and property flipping project and allows them to understand their financial benefit. These free spreadsheet templates allow you to calculate the financial returns when developing a gated community real estate project. The spreadsheet includes different sheets to input the master plan for 3 main categories of buildings (e.g. condos, apartment, commercial) and up to 10 subcategories each, a pricing sheet to forecast rent and sale income, some other sheets and a cockpit spreadsheet to control the model and easily play around with the assumptions. Based on the projected cash flows the IRR for equity shareholders is calculated. The model is made for a buy and rent scenario, a buy and sells scenario is expected to be added in the future. Below screenshot provides an excerpt of the spreadsheets contained in the model. See here, for more related real estate developer spreadsheets. The Gated Community Financial Model calculates the profitability of a real estate development project with residential and commercial buildings. Investing in commercial real estate has become a valid alternative for investors, as one normally has to deal with fewer tenants for the same amount of square meters as residential real estate and the rental contracts can be more long-term. Investors are more sophisticated and need to understand the return potential when entering into a commercial real estate investment. This analysis requires quite some time, for which a good spreadsheet template is needed. The commercial real estate investment model normally has a variety of sheets where the rent-roll is the most important one. Rent-roll is a simple list with all tenants renting space in the property and there is normally an algorithm used to predict the future cash flows of the tenants based on assumptions such as the length of renewed leases and periods of vacancies. Thus a spreadsheet template is needed which helps you to steer the assumptions in a simple way, calculate the cash flows and the return for investors. Of interest to investors are especially cash on cash multiples for their equity investment and their expected IRR. Below screenshot shows the summary of the spreadsheets contained in the model. 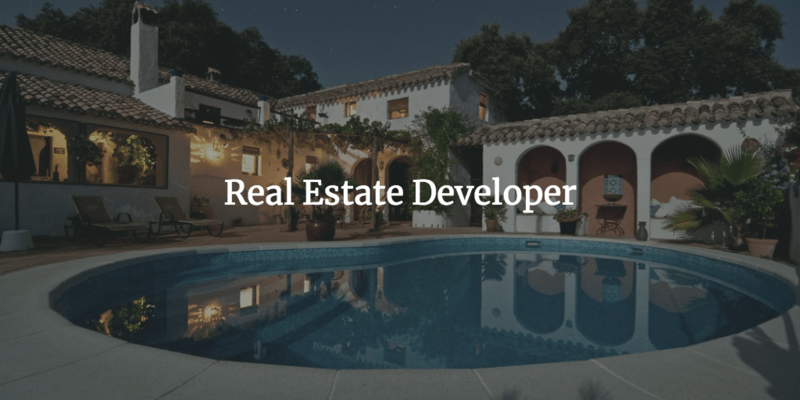 Real estate investors who are looking to buy and rent a residential property want to understand the future cash flows of their investment and their benefits when paying down the mortgage. The rental property spreadsheet template provides the framework to model the cash flows for a buy and rent project. The financial model outputs the IRR to investors. Thus investors can easily check how well their investment project compares to their other investment projects. Below screenshot provides an excerpt while the financial model contains a more detailed spreadsheet to forecast the cash flow to the property owner. This financial model allows you to understand the future cash flows of a parking and shuttle bus operator. You can input the number of parking spaces, the average daily rate, and the cost assumptions to operate a shuttle bus e.g. from an airport or a hotel car park. The spreadsheet outputs the investor relevant metrics. So if you ever have wondered how profitable it might be to rent and operate a car park, this is the spreadsheet template for the relevant financial calculations. Below screenshots provides you with the cockpit view where you can easily change the assumptions and immediately see the output. The spreadsheet template for biogas projects models the expected cash flows and calculates the NPV and IRR. This spreadsheet includes a comprehensive financial model to also understand the expected balance sheet over the next years. Thus the spreadsheet template provides an easy way to come up with a multi-year financial plan for a biogas project. Below screenshot shows the key assumptions used in the financial model. The Biogas Financial Model forecasts the expected financials for a Biogas plant project and calculates the IRR and NPV values for the project. The Wind Energy financial model provides the framework to derive the income, balance sheet and cash flow for a wind park project. The spreadsheet calculates the IRR and NPV for the project to allow investors to understand its financial viability. The spreadsheet template provides all that is needed to quickly understand a wind park project from a financial perspective. See below the assumption used in the spreadsheet. The Wind Energy Financial Model forecasts the expected financials for a Wind Park project and calculates the project's IRR and NPV. 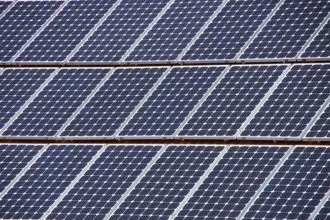 This financial model calculates the IRR and NPV for a solar energy project. The spreadsheet projects the income statement, balance sheet and cash flows for the solar park over the next years and allows investors important insights on how to finance the project and its financial viability. The spreadsheet template can easily be understood when reading the summary. The DCF spreadsheet provides a framework to value a company based on the Discounted Free Cash Flow (DCF) analysis. This company valuation excel spreadsheet template allows a comprehensive view of a company’s expected Income, Balance Sheet and Cash Flows during the next years. Below screenshot discloses how the DCF calculation is being done, while the company valuation spreadsheet contains more detailed financial projections to derive the company’s cash flows from the expected income statement, balance sheet, and cash flow statement. Another company valuation Excel spreadsheet is the Hotel Valuation spreadsheet, which measures the returns for a hotel investment and comes up with a DCF Value for the hotel. The spreadsheet template uses similar logic as a commercial real estate investment model but is very specific to the hospitality industry by taking into account the revenue streams from the hotel and restaurant. The hotel spreadsheet template gives you a structure to model the cash flows for the hotel, provides a DCF valuations framework and the tools to understand the profitability of the investment through IRR analysis. Ever wanted to understand how profitable it could be to start a gold mine? This finance spreadsheet template calculates the cash flows from the gold mine based on the ore grade and gold content as well provides a structure to assume all the related cost assumptions. The spreadsheet then calculates the investor relevant metrics to understand the profitability of the gold deposit. The Gold Mine Investment Model is used to determine the financial feasibility of a proposed Gold Mine Investment. The Financial Model outputs IRR and NPV based on the Mine Life expectation. As per Bill Gates, there is no better investment for poor people than a poultry farm. This spreadsheet template goes a bit beyond this claim and models the expected cash flows for a mid-sized broiler farm operation by using specific poultry farming related assumptions. Therefore, it makes it easier to come up with a business plan as required by banks and investors to understand the expected cash flows of the farm over the next years. The company valuation Excel spreadsheet also contains a valuation framework to calculate the value of the poultry farm via DCF analysis. Below screenshot summarizes the financial spreadsheets contained in this model. 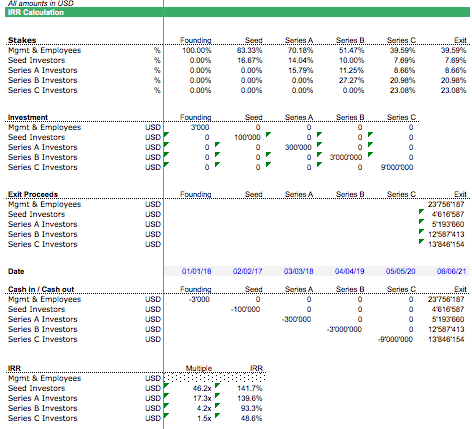 For more free spreadsheets, please check our main page financial model templates. This entry was posted in General and tagged spreadsheet template. Bookmark the permalink.